Email marketing is one of the most popular and reliable methods to engage your website’s audience and increase your profits. In fact, the only downside to email marketing is that it can be quite difficult to jump into, due to all the information and tools you need to juggle. The good news is that if you know how to compose a solid campaign, you can make the most of whichever tool you have chosen. After all, what subscribers care the most about is the content itself. In this article, we’ll teach you the three core elements that make for an excellent email marketing campaign, and how to implement them. Before we get to that, let’s take a minute to discuss why email marketing campaigns are such a useful tool. Marketing campaigns are ubiquitous these days. Different companies and individuals are always trying to promote new products and services via every channel, and email is no exception. 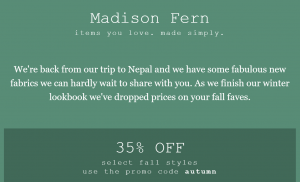 The example below shows a section of a promotional email offering subscribers a discount. ➤ Short-term results. Marketing campaigns are usually designed around long-term strategies, but email enables you to take immediate action thanks to analytics. They can also provide a fast Return on Investment (ROI) since they’re a direct form of marketing. ➤ Easy to share. Email campaigns make it easy for recipients to share them, which translates to an expanded reach. ➤ Precise targeting options. Some email marketing tools enable you to segment your audience according to specific criteria (like engagement with past messages) and target future campaigns accordingly. ➤ Inexpensive. In some cases, email marketing can be exceedingly cheap – certainly much more so than traditional media alternatives. ➤ Personal touch. 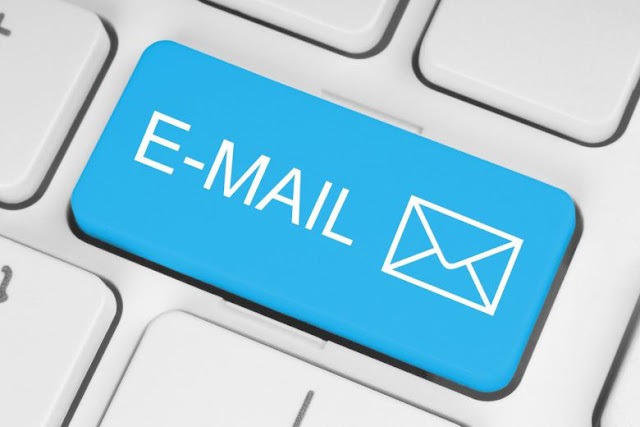 Email is, at its core, much more personal than most traditional marketing methods. It enables you to provide a personal touch and engage your subscribers by making them feel like you’re reaching out to them directly. As you can see, there’s no shortage of reasons why you should consider giving email marketing a go (if you haven’t done so already). Now that we’ve highlighted how effective the platform can be, let’s review what makes for an excellent email marketing campaign. Each email marketing campaign is unique, but there are a few maxims that hold true for the vast majority. Regardless of the topic of your campaign, it could definitely benefit from implementing these three elements. 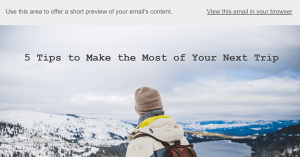 When it comes to email marketing, your headline will be the first thing that readers see. In fact, it’s one of the key factors when it comes to determining whether your email will even be opened. The headline below, targeted at a specific audience, is very explicit about what to expect from the content of the email. ➤ Relevancy. They are relevant to the topic of your campaign. Readers shouldn’t be left wondering what the contents of your email are after reading your headline. ➤ Actionability. Headlines that make it clear you’re offering a solution to a particular problem often convert better than generic titles. ➤ Length. An ideal headline shouldn’t be too long or too short. Studies show that titles around the 55 character mark perform better among readers. Once you’ve incorporated this advice into your next headline, we recommend that you use CoSchedule’s Headline Analyzer tool to check it over. This service analyzes and scores your headlines according to several criteria – including word balance and length – to give you an idea of their effectiveness. That’s it for headlines, so let’s move on to the meat of your campaigns – the content itself. It goes without saying, but it’s crucial that you keep the content of your marketing campaign relevant to your subscribers. In most cases, they subscribed to your email list for a reason, and it’s up to you to make sure they don’t come to regret it. The best way to do this is to provide them with information they’ll find useful. ➤ Interesting posts. If you’re a decent writer or constantly on the lookout for interesting pieces, you’ll always have something to share with your readers. ➤ Free resources. Everyone loves a freebie – especially if it’s something relevant to their interests. Think free e-books, online courses, or even product trials. ➤ Update notices. If someone signed up to your list, chances are they’re also interested in your website. Keeping them up to date with the latest developments regarding your site and the products or services you offer is bound to interest them. When it comes to email marketing, there’s no wrong approach to content – as long as you’re not pushy and focus on providing relevant content to your readers. In case you don’t know, a Call To Action (CTA) is a prompt that encourages readers to perform a particular task. It usually comes in the form of a button with a brief, punchy message like Sign Up, Buy Now, or Find Deals Now (like in the image below). CTAs are a critical element of any email marketing campaign since they enable you to achieve conversions. If you’re working on a campaign, chances are you’re trying to market a product or service. 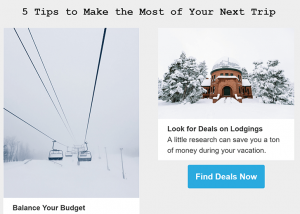 A compelling CTA can increase your chances of convincing users to buy or sign up. 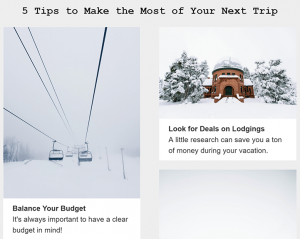 Simple CTAs can be as effective as great content when it comes to increasing conversions, so they’re definitely worth paying attention to.